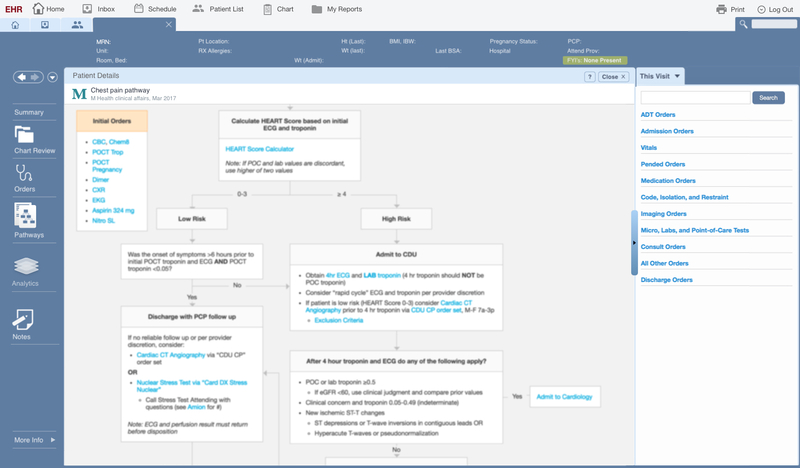 Empower a smarter, faster organization with predictive and proactive decision support that embeds clinical pathways and predictive analytics into everyday clinical workflow within your EHR with integrated order entry and clinical documentation. Without leaving your EHR, clinicians instantly access your latest clinical pathways, protocols, and dynamic order sets. 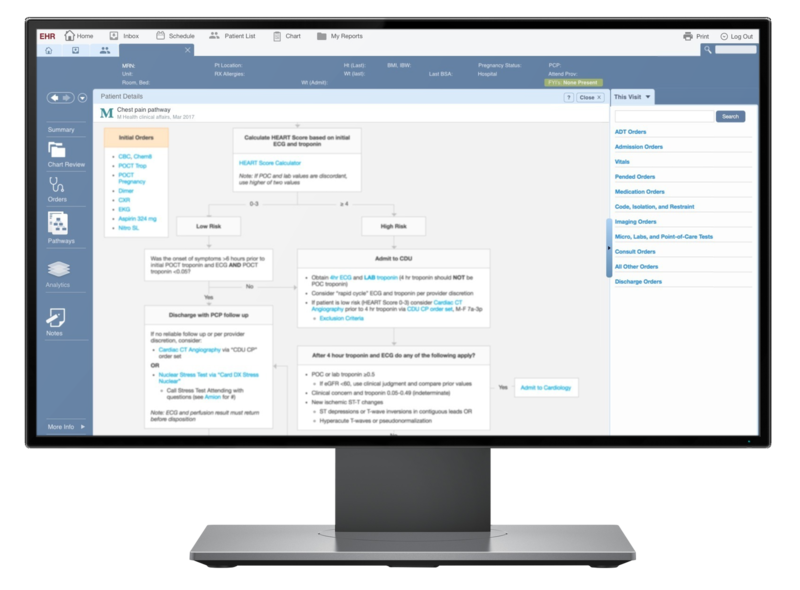 AgileMD is workflow-integrated to support clinical decision-making, drive order entry, and streamline documentation – all within Epic, AthenaHealth, Cerner, and other major health record systems. Engage your clinical leaders in designing shared care standards and together we will deliver your best-practice workflows seamlessly into your EHR. We'll then provide the detailed analytics and data on adherence and outcomes needed for continuous process and quality improvement. We provide end-to-end integrated solutions for true clinical transformation – developing, implementing, measuring, and iterating clinical standards. The AgileMD Cloud CDS engine is SOC-II and HIPAA compliant with industry security architecture. Our hosted platform requires no on-site hardware and operates behind multiple layers of protection, encryption and network security, with advanced audit logging and monitoring services. Our technical team has worked with many premier IT quality control processes around the world and is ready to collaborate with your IT team to configure the right security framework. Each plan is tailored to your clinical workflow and includes features that save you time and deliver better care. Discounts for multi-year contracts. Change plans without penalty. 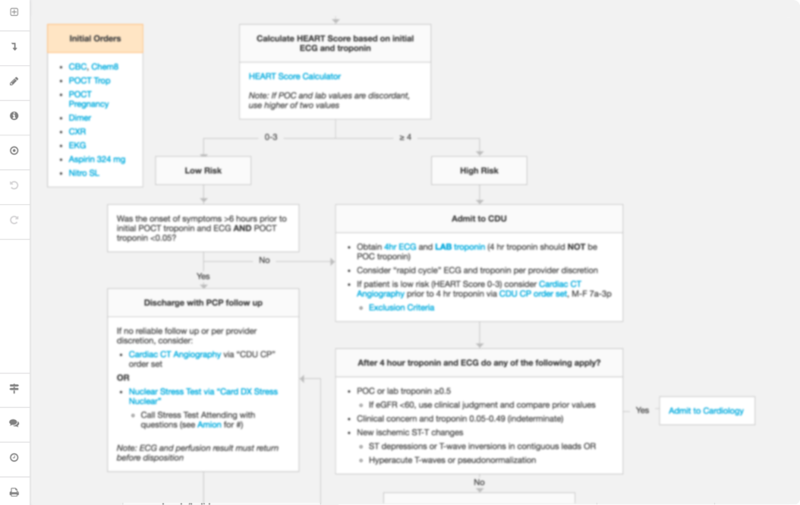 Integrated order entry and documentation Orders recommended by clinical pathways and analytics can be rapidly accepted and directly placed by clinicians, and documentation is prepared based on usage of evidence-based best practices, creating a one-stop shop for decision support. EHR integrated with optional mobile access Access information from our iOS, Android, and web-based applications as well as our EHR-integrated product. Our team can integrate your clinical pathways and analytics into Epic, Cerner, AthenaHealth, and other major EHR systems. Analytics and visibility Analytics track usage and adoption of clinical best practices to support continuous process improvement. High-quality, proven resources Create protocols and guidelines using our online tools. Or, license best-practice resources from our partner institutions and publishing affiliates. Then, tune licensed content to your strategic objectives. Email, phone, and on-site support Each engagement receives the attention of a senior AgileMD account manager. In addition, a member of our training team can conduct on-site education seminars as needed. Industry leading PHI security All data is stored behind multiple layers of protection and encryption with advanced audit logging. Our technical team has worked with many top-tier IT departments' quality control processes and welcomes an opportunity to work with your team to configure the right security framework. High-quality, proven resources Create protocols and guidelines using our online tools. Or, license best-practice resources from our partner institutions and publishing affiliates. Then, tailor licensed content to your particular goals. Email, phone, and on-site support You will be assigned a dedicated member of the AgileMD team for questions and program management. In addition, we can conduct on-site education seminars as needed. Control and visibility Use our management dashboard to add new users, change per-user authorization settings, or revoke access at any time. Auditable security All data is stored behind multiple layers of protection and encryption with advanced audit logging. Our technical team has worked with many top-tier IT departments' quality control processes and welcomes an opportunity to work with your team to configure the right security framework. Advanced data access Review detailed statistics and receive comprehensive data pulls for use towards internal research studies. HIPAA or similarly sensitive data can be stored in our PHI data-vault as needed. Eliminate paper and centralize updates Upload commonly used resources (such as phone numbers, residency handbooks, conference notes, schedules) or create interactive files using our online tools. Our content management team can help organize information and transition from printed materials to digital editions. Mobile and web access Access your information from the most popular smartphones and tablets. Data automatically syncs to the device for offline use. Email and phone support Contact our Member Services Team with any questions 24/7 via support@agilemd.com. You will also have access to our priority support line. Easy, instant sharing Use our management dashboard to share resources with anyone via email. We'll automatically send an invite to create an account if it does not yet exist. Revoke access at any time, for any reason. Secure storage All data is stored behind multiple layers of protection including secure transfer, encryption, network restrictions, and application-level policies. Usage analytics Review core statistics about when and how your resources are used. Trend graphs show which files are most and least popular over time. Our analytics team will also email monthly summaries. How much, exactly, will it cost? AgileMD is combination of software, services, and content subscriptions. The prices above reflect typical ranges for our engagements. The total cost will vary depending on the number of sites and departments, the extent of the EHR integration, external content licensing, and the scope of analytics services desired. Send us your requirements to learn more. Is there an evaluation period? Yes. All paid plans include a complimentary 60-day evaluation period. If you opt to integrate AgileMD into your EHR, the evaluation is available in non-production environments. Who retains ownership rights to content? You do, for content you upload or create on AgileMD; you can also request a full export at anytime. Details about content licensed from other institutions can be found in our Terms and Conditions for Organizations.